Digital mechanisms are gradually taking over the nature of market transactions. With a large number of resolutions and devices on the digital market, a responsive web design offers a means of product establishment and effective communication with the target audience. Responsive designs are a flexible and aesthetically-pleasing mobile web solution which will adapt, resize, and allow potential buyers to view the product while on the go, and through whichever browsing platforms they choose. 75% of users admit to making judgements about a company’s credibility based on their website’s design. Most popular amongst our clients, is the WordPress package, which boasts high functionality and ease of use. With WordPress, you have the freedom to build a website with as many pages, categories and articles as you see fit; this is done simply by accessing the WordPress Administrative Area from your browser. If you would like your content to feature a wider array of “voices”, WordPress allows you to invite other authors to enter the Administrative Area and post their own work. When sending out this invitation, you may regulate the level of control the author(s) have over publishing and editing the website. Once everything has been setup, including incorporating the custom design that will match the rest of the web site – no additional HTML skill is necessary. The “code view” option offered by WordPress is unnecessary for the publication of simple content, but useful for more experienced web-builders; it is used to alter the HTML code in a page, post or article. 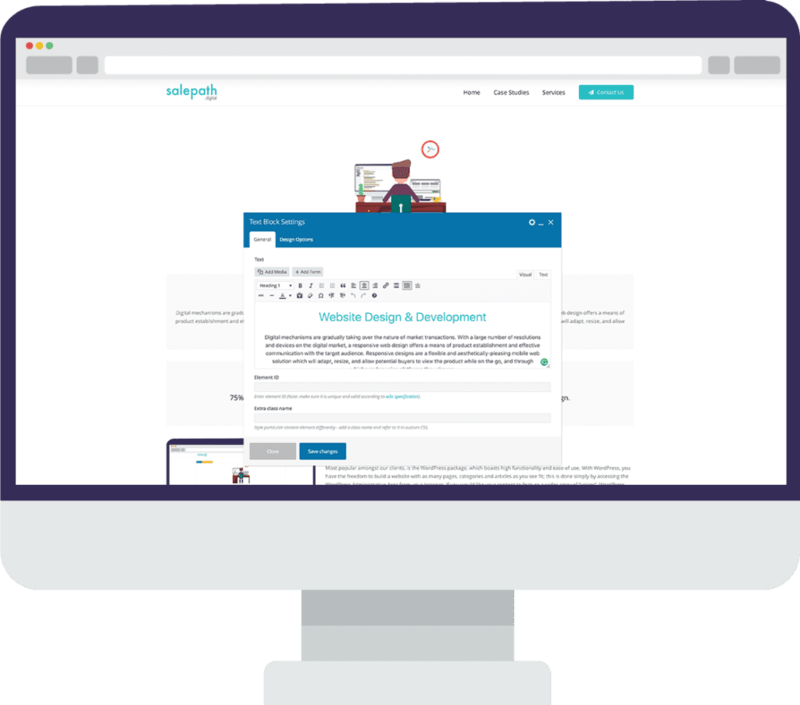 WordPress also contains a WYSIWYG editor that lets you watch your modifications take effect as soon as they are applied; this enables you to morph your vision quickly and efficiently. WordPress powers 28.9% of all websites on the web, including 14.7% of the top 100 websites in the world. Mijireh Checkout – Accept credit cards via Stripe, Authorize.net, PayPal, eWay, SagePay, Braintree, PayLeap, and more. Need a specific payment gateway? Perhaps additional shipping methods? WooCommerce has a plethora of eCommerce extensions available to provide just that. 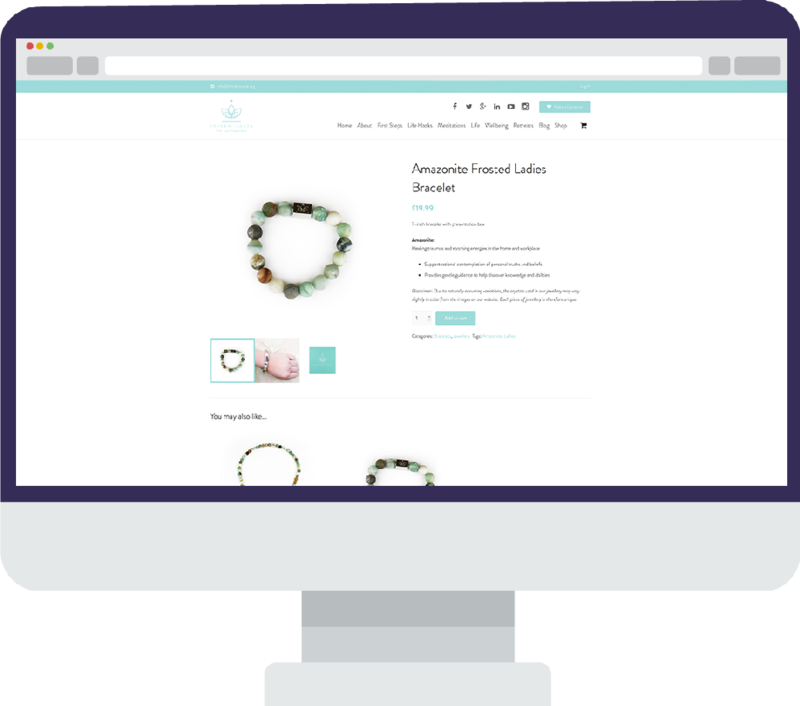 eCommerce is growing 23% year-over-year, yet 29% of small businesses do not have a website. Users notice if websites don’t run well, so optimising rendering performance is crucial! The amount of data downloaded online continues to increase over time, so to deliver great performance you must optimise data delivery as much as possible. Our service optimises your website by prioritising the display of content that relates to the current user action as well as identifying and fixing bottlenecks. How well does your current website perform on mobile? Enter your domain below and find out, including “http://”. This may take up to a minute. Speed = Pass! The speed of this site is rated . No work is needed! Speed = Ok. The speed of this site is rated . This is "ok" but could use some work. Speed = Fail! The speed of this site is rated . Work is needed to optimise this website for mobile devices. Usability = Pass! The usability of this site is rated . No work is needed! Usability = Ok. The usability of this site is rated . This is "ok" but could use some work. Usability = Fail! The usability of this site is rated . Work is needed to optimise this website for mobile devices. Your page has landing page redirects. Redirects trigger an additional HTTP request-response cycle and delay page rendering. Your page has browser plugins. Most mobile devices do not support plugins, and plugins are a leading cause of hangs, crashes, and security incidents in browsers that provide support. Your viewport is incorrectly configured. Without a correctly configured viewport, mobile devices will render the page at a typical desktop screen width, scaled to fit the screen. Your page has resources that do not utilise the browser cache. Setting an expiry date or a maximum age in the HTTP headers for static resources instructs the browser to load previously downloaded resources from local disk rather than over the network. Your server response could be improved. Server response time measures how long it takes to load the necessary HTML to begin rendering the page from your server. Your page has unminified CSS. Compacting CSS code can save many bytes of data and speed up download and parse times. Your page has blocking script resources and blocking CSS resources. This causes a delay in rendering your page. Your above-the-fold content is not correctly prioritised. If the amount of data required exceeds the initial congestion window (typically 14.6kB compressed), it will require additional round trips between your server and the user's browser. The contents of your page do not fit within the viewport. On both desktop and mobile devices, users are used to scrolling websites vertically but not horizontally, and forcing the user to scroll horizontally or to zoom out in order to see the whole page results in a poor user experience. Some of the text on your page renders in a way that may be difficult for some of your visitors to read. Use legible font sizes to provide a better user experience. 61% of consumers stated that they are more likely to work with a local business if they have a mobile-optimised site. We provide a range of security services to help you assess and develop your website’s security capabilities as well as offering advice so you know how to respond to incidents. Our services will help you build confidence, understand and react to threats and vulnerabilities so you can protect what’s important and secure your digital environment. We will also advise you how to behave securely and help you manage risks so you can build confidence in your digital future. Our plans come with all the features you’ll ever need! Based in the UK, our servers are fast, reliable and secure for low page load times and no downtime. Your private and secure email is accessible through your phone, tablet and desktop, using your mail client or webmail. cPanel is installed as standard for easy web-based management of your hosting account. On top of all that, gone are the times when you wait days for support, we’re quick, friendly and aim to please!